A workshop entitled “Tools for production enhancement - LEAN, KAIZEN, TOC, GEMBA” held by Progress Project Sp. z o.o. took place on 24-25 September 2015. The workshop was financed by the National Training Fund (KFS). It was addressed to senior and medium management and production control staff. 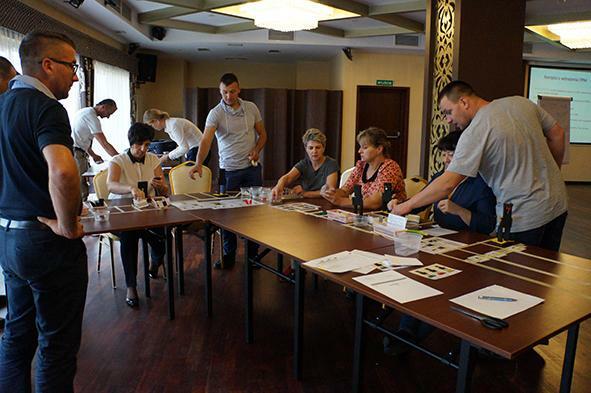 The aim of the workshop was to become acquainted with the tools and systems of modern planning of business processes, allowing to design activities aimed at perfecting the production processes of the company. The ability to remove the sources of wastage and eliminate unnecessary activities, reduce costs, eliminate the causes of errors which affect quality, to remove limitations and obstacles of productivity enhancement. The workshop was devoted to the Kaizen philosophy as the system of continuous enhancement of industrial organization. During the training examples of the application of Kaizen, Lean, Toc, Gemba methodology were shown to the participants. They also learned about several methods of application and organization of systems in an industrial company. The techniques of creative identification and solving of problems were also practiced. Methods of team implementation of changes were discussed as well. We would like to thank all the participants for taking part in the workshop.